SecuritySolutionsWatch.com: Thank you for joining us today, Mark. Congratulations on your recent appointment as President of GE Security Americas with responsibility for all commercial and customer service operations in the United States, Canada and Latin America. Please give us an overview of your background. Mark Barry: I started my post college career in commercial printing running a manufacturing plant, but after 6 six years entered the security industry when I joined ADT in 1990. I was fortunate enough to progress through a series of roles including sales manager, general manager (GM), regional operation manager, and regional gmGM. On behalf of the parent company, Tyco International, I moved to Asia in 2001 as Sales / Operations VP and became division president in 2003. My years in Asia were an amazing experience and allowed me to continue to learninglearn the more about the industry from very different perspectives. I came home to the U.S. and to GE Security in early 2008. They GE Security waswere looking for someone to drive performance in the Americas and after my time in Asia I found this to be an interesting challenge and an opportunity to learn more about our industry from a manufacturers perspective. 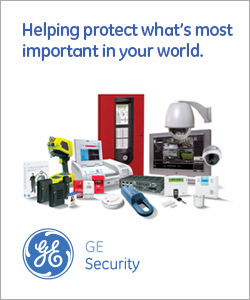 SecuritySolutionsWatch.com: GE Security is well-known as having one of the industry's broadest product portfolios, covering explosives and narcotics detection, intrusion and access control, video surveillance, key management, and fire detection. Please give us an overview of the security solutions provided by your business unit. Mark Barry: We do have a broad portfolio of offerings. In and in the past year we've been working hard on making products interoperable so that we can deliver total solutions to our customers. You mentioned the broad categories, we tend to think of products in a matrix that includes four columns (Intrusion, Fire, Access, and Video) and three rows (high end, mid tier, and mass market). One of our goals is to have industry leading product solutions in each of the categories. SecuritySolutionsWatch.com: What are your key target markets and what is your perspective on the market drivers for GE Security solutions at this time? Mark Barry: In the current economic climate we are seeing strongest demand for our intrusion products. Product sales into new construction are softer than we would like, but we are seeing the construction industry increasingly focus on retrofit opportunities, and we are enjoying related sales across the portfolio. We remain strong in our key verticals market including; healthcare, education, financial, and government. SecuritySolutionsWatch.com: We read with great interest your recent announcement regarding the EST3-Sixty Mass Notification/Emergency Communications (MNEC) solution, which provides new levels of protection and communications access to people in educational, military, industrial, commercial and other facilities of any size. We understand that EST3-Sixty is the world’s first MNEC system to achieve the Underwriters Laboratories (UL) new mass notification standard. Care to elaborate for us regarding the benefits and value proposition of the MNEC system? Mark Barry: GE Security’s Mass Notification solution, EST3-Sixty, integrates sophisticated command and control capability with high-performance threat detection such as fire alarm, security, and access control functions. During crisis situations, it combines live and recorded voice audio with emerging technologies like text messaging and email broadcasts to provide the right information at the right time to the people who need to know. EST3-Sixty is the industry’s first such system to be listed to UL 2572, the new Underwriters Laboratories standard for Mass Notification. UL 2572 separates the wheat from the chaff. It provides an objective third-party pass/fail assessment of a product’s ability to perform as promised – and perform in line with the expectations of a Mass Notification system. EST3-Sixty’s UL 2572 listing provides a verifiable benchmark against which ultimately all Mass Notification systems will be based. It lends authority to the leadership role GE has already assumed in this new and emerging field by evaluating, not only each EST3-Sixty component, but more importantly, how the system functions as a whole, and under varying operating conditions. Mass Notification will shape the life safety industry for years to come, and this benchmark listing demonstrates that GE has already carved out a defining role in its development. We’re delighted to be at the forefront of such an exciting and challenging new opportunity, and we look forward to leading its growth in the future. EST3-Sixty utilizes the existing installed base of 10 + years of the EST3 Fire alarm system installations. Using the existing EST3 infrastructure, we approach Mass Notification in a holistic manner. While many technologies exist to inform people in a crisis situation, we use the power of our Command and Control Center to integrate multiple communications methods. Utilizing our customer’s current communications technology, whether it is email, text messaging, text and digital signage or paging systems, we provide a complete integrated approach to crisis management. SecuritySolutionsWatch.com: We also understand GE Security has recently introduced FireworX brand of conventional and intelligent addressable fire and life safety systems representing a cost-effective fire alarm solution and GE Nav v2, representing the latest advancement in digital video recording (DVR) management software. Please give us an overview of these recently announced GE Security solutions. Mark Barry: Fireworx is a new brand of intelligent and conventional fire alarm panels that represent GE’s commitment to the entire spectrum of Life Safety applications. Geared primarily to small and medium sized installations, FireworX is a fresh new solution that was designed from a clean slate, and that we introduced this year close consultation people who install our products and use them every day. As a result of this exhaustive development process, FireworX has been welcomed by installers and users alike for its simple setup and reliable performance. SecuritySolutionsWatch.com: Are there any particular “wins” or success stories you’d like to talk about? Mark Barry: The product launches discussed above are great examples of wins. They represent a real internal success story about the sales organization and product organization coming to together to launch the right products into the right segments, at the right time. SecuritySolutionsWatch.com: What resources are available for end-users at www.GESecurity.com ? Mark Barry: At GESecurity.com, end-users can find the latest information on our access, fire, video and intrusion product lines. This would include literature, data sheets and case studies. Most importantly they can find a GE Security professional in their area that can help them address any security product questions or needs they have. SecuritySolutionsWatch.com: One will read on your site that, “GE Security's sales, technical, and customer training programs provides you with the knowledge and skills to make you, your team, and your business more successful.” Please tell us more about GE Security’s various training programs. Mark Barry: In support of our customers, we provide product-focused training that teaches our customers how to install our equipment, program our applications, and administer their systems. The majority of our classes are delivered in an instructor-led, hands-on environment that certifies mastery through competency testing. In response to customer needs, we often ship our equipment and send our trainers out to conduct training at their site. In order to assist our partners with their ongoing staffing needs, we deliver industry training such as Fire Alarm Technician and Video Technician, which introduces students to industry regulations, standards and practices. Because we’re sensitive to travel expenses and productivity losses due to time away from work, we have developed several online learning courses that serve as pre- and post- classroom work. Not only does this shorten classroom time, but students can also access the training at their convenience. We have received very positive feedback from our customers for this model, and are committed to further expanding our eLearning solutions. We are currently breaking our classes up into modules to be delivered through virtual classrooms, eliminating the need for students to travel to central training facilities at all. In regards to sales training, we provide full solution selling sessions for our customers, which focuses on their demo equipment, details a product’s value proposition, and outlines a product’s differentiators. In addition, we are developing pod casts for our internal sales teams. These short product reviews are designed to be uploaded to an iPod or other audio device. They can then be listened to while traveling from customer site to customer site. The math is simple. We know that our success is predicated on our customer’s success, so we are committed to providing them the very best in training. SecuritySolutionsWatch.com: Any particular strategic relationships you care to mention? Mark Barry: GE Security is constantly reviewing its operations, organizational structure and products and services in order to support our growth strategy and meet the needs of our customers. With that said, we are always looking for opportunities to expand our product lines and global reach both organically and through partnerships. SecuritySolutionsWatch.com: Thanks again for joining us today, Mark.